It would be nice to write that the gardening season is on but that would be a lie. We're not there yet, the weather is still cold and it could get even colder. 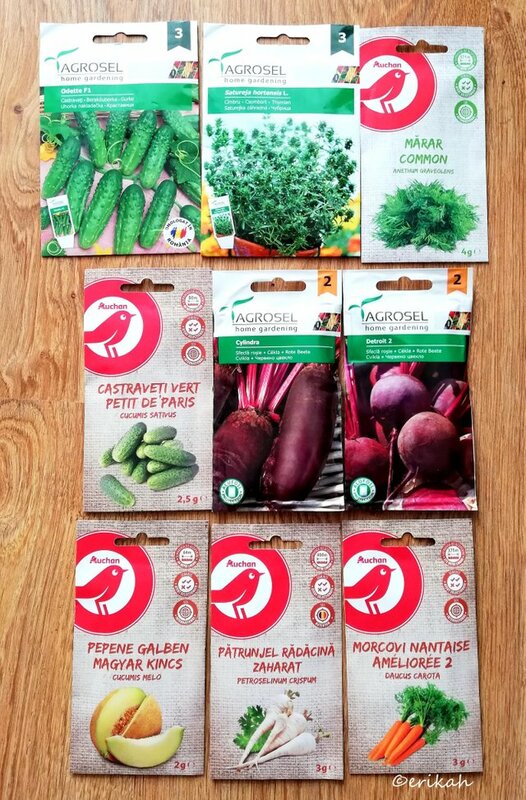 Till then we can do some planning and seeds can be bought as well. We have a lot of seeds from last year but there are a few missing. The first is cucumber, which is very important, we grow it every year, eat it fresh and make pickles as well. I also use it to hydrate my skin. Next in line is Summer savory which is needed when I make pickled cucumber and also for soups and pottage. Dill is also a must. Two different type of beetroot which is my favorite as salad during winter. Honeydew (melon), there's no summer without it. I just love to go out in the morning, pick one and have it for breakfast. It's the best breakfast during summer. Carrots and parsley are also necessary for cooking. So this is it for now but I want to buy some black tomato seeds and mint. Mint is something I've been dreaming of planting and now is the time. Tomorrow is shopping day, let's see if I can find what I need. You got all the yummies! You're way ahead of me. I bet the weather is milder over there. You're a very hard working gardener :) Well done! I'm thinking of planting some portulaca seeds inside but it might be too early still. It is warm and sunny and I see lots of things start to grow already. I never know when to sow annual flowers here. I am sued to the Polish gardening timetable. But here it is all different... so I do it earlier when I think its time :P Lots of experiments. Some grow, some don't. To be honest, the weather is not what it was before of what it should be. Sometimes we start planting and then it starts to snow and everything freezes. It's always a gamble. Unfortunately. Did you ever planted daffodils or hyacinth at this time of the year? I'm asking because I know these spring flowers are supposed to be planted during the Autumn. I never experimented and I'm curious if they bloom in Spring. Actually I didn't. Last time I did it was still in fall, but I got the bulbs now and I saw they started to grow in a bag, so I planted them :) Fingers crossed. I will definitely show them when they bloom. Love their flowers! Very cool! Check out my post to see what I am growing this year! Good luck growing! I will follow! I had lavander in a pot last year and it was terrible, a total disaster. I don't know what went wrong but they grew 10 cm then they were looking like some hunger strikers. I had to throw them out. I hope you are going to have better luck. Mint is a lot easier if you buy a small living plant. It will grow and spread fast. I've got a growing collection of flavors. Spearmint, Peppermint, Strawberry scented, and also Lemon Balm. Some people really enjoy starting from seed, but I have trouble getting seeds from perennials like mint to sprout and sometimes it takes a couple years before they will spread vigorously. I was able to grow lavender from seed last year, and that took a lot of patience and failures before I got one to survive. The photo for parsley has a white root? Is the root meant to be edible and harvested? I thought it was a parsnip at first. Thanks for sharing. I am learning and teaching myself how to garden too. Love to experiment with seeds and try new things in the back yard. Going to grow my first melon this year. The neighbor has mint in the garden, I think it would be a good idea to ask for some and relocate them in our garden. Yes, the parsley has a white root and it's edible, we use both, the root and the green part as well.